Another season of Big Brother is upon us! 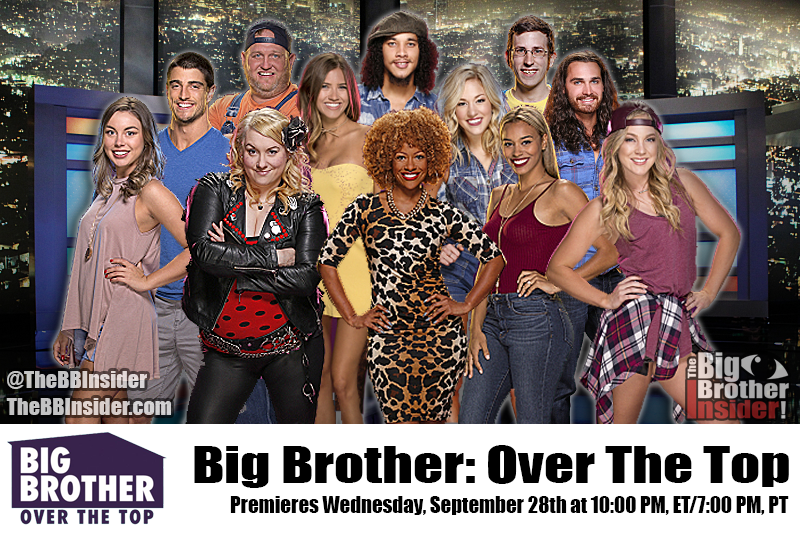 With it being just ONE week since the Big Brother 18 finale, it's already time for another batch of houseguests for Big Brother Over The Top! Every year I, John (Owner of The Big Brother Insider), sit down and read the CBS's bios, skim some press interviews, and watch some videos and attempt to write down my thoughts on the new batch of houseguests. As I did last season, I decided to invite my writers to join me and offer their first impressions of the houseguests as well. Our general writer; Taylor, and our new opinion columnist; Ashley each offer their own take on this diverse group of newbies. John: I might be a little biased because she already follows me on Twitter, but I really like Alex! She seems very bubble, will likely play a great social game, and knowledgeable. She is a legit superfan, I read somewhere she's a feedster - so up's for that. She said she wants to be remembered for "playing the game" and not floating to jury, but we'll see about that...I have high hopes though. Taylor: Dallas, TX girl + a super fan! Fan of hers already. I really like her quirkiness, I think that she will play the social game extremely well. I would say Alex has a good chance of making it close to the end, maybe top 4! I really like her attitude, and think she will be awesome to watch this season. Ashley: Alex likes the quirky nerds, maybe she'll cling to Scott? I love that she mentions having a strong social game. Her thoughts on the game definitely seem super similar to her sisters. Normally I'd probably be annoyed that we had siblings in the house again so soon but these two are easily my favorites going into the premiere so I don't mind it. My fear for Alex is she seems super concerned with how we view her game and might make big moves just for the sake of making sure America respects her game and big moves aren't always the best moves. John: Danielle, the new and improved Zakiyah! Gives me a BBCAN3 Britnee vibe. Says she'll combine Dr.Will, Rachel, and Derrick's games and that's a lot to live up too. Says she's not afraid to play the game and "get blood on her hands". She seems assertive and confident. I like her, but I just get an overall impression she'll end up being a dud. Taylor: I like Danielle a lot! In her cast interview she said she hopes to dominate competitions, and I love a strong female so I hope she can do that! I also liked that she knew a few of the top players from previous seasons. I’m hoping she will stay true to her cast interview and really play the game this season! I’m thinking she will go final 2! Ashley: I really really like Danielle and something about her reminds me of Dani Donato so much. I think it's her voice or her mannerisms or something. She sounds like she would be absolutely perfect for BB19 but this is Over The Top. I'm not sure how the new format is going to affect her. It's clear she's a superfan who's ready to go in there and make big moves and play Big Brother in it's purest form. I worry this isn't going to be what she wanted at all. John: I don't know what about him I don't like - I just know that I don't like him. He seems annoying and seems more interested in getting in a showmance than playing the game. I feel like he was grabbed outta a bag of recruits and dropped in here without a clue of what to do. He's my first boot prediction. Taylor: Eh, Justin. Not a fan. I just have the hardest time rooting for people who go into the house wanting a showmance. But, his personality seems fun, I think he will entertain the house… for a week or two before he walks out the door. Ashley: No. Just no. This guy will not win Big Brother Over The Top. I feel like he didn't mention ANYTHING game related in his game. He sat there giving us random facts about himself almost the entire time and I could see him getting in the house and doing this all day long. I know I for one would be extremely annoyed. John: I absolutely love this girl, and after seeing her viral video, I even love her more. I think she's going to bring the entertainment factor and hopefully some good diary rooms. I suspect she'll go far because I have a feeling she'll play a GREAT social game. Taylor: I liked her saying that she wants to be a mix of a floater and a shark. Kryssie seems like a really cool girl! I just am not sure how she will do. I’m sorry to say I don’t think she is going to be a comp beast, or a social game master. I would imagine she will be out pretty early. Ashley: Kryssie lives super close to my hometown so a part of me just has to root for her. I was really surprised to hear her say she loved Jordan and also the brigade. Those are the complete opposite of each other but taking bits and pieces from each could really serve her well if she does it right. John: Cornbread reminds me of a Chicken George/Donny combination, and I kinda like him. I already predict he'll win America's Favorite Houseguest and I see him going far - like Donny. I think he'll just be that likable guy that people will want to keep around. I don't foresee him making any big moves, will likely just vote with the house and provide entertainment. Taylor: I agree with cornbread, I think he is a likable guy! He has such a sweet, funny personality. I hope he will go to work in the game like he said, but if not, I think he may go as far as Chicken George, or Donny. Ashley: First off, what makes a person wake up one day and decide "I'm going to start going by the name Cornbread?" This guy is not really my cup of tea but he is different and I like that. I love when casting goes for someone a little outside the box. He could definitely have some Donny from BB16 upside when it comes to any votes coming from America. John: Is Monte our "pretty boy" this season? I can't tell....He said it himself, I suspect he will be a competition beast. He's eager to get into a showmance, and I think he will. He mentioned "strong" and "competitive" a lot in his less than two minute interview. Overall, I think he'll go far. Taylor: Potential competition beast, country boy Monte! I love Monte, he seems loyal, and like he will isn’t afraid to play the game! I hope he doesn’t allow a showmance to ruin his game. I would love to watch him go final two with Danielle. Ashley: From Bronte to Monte, this guy has no idea what is in store for him. He definitely looks like he could be good at competitions but the statement "let people know that I'm not to be messed with" doesn't sit right with me. You don't know who's in there yet, you could get along really well with everyone, you shouldn't be thinking like this before entering that house. If he's as loyal as he says he is, he could be a great person to form an early alliance with. John: She said it herself, "I'm over the top energetic" and she's got a great personality to boot! Morgan seems very calm and collected, and bubbly. She might be a little naive on what's she's got herself into, but I have a feeling her sister Alex will be able to help her navigate the waters. I think she's smart and ready to play the game. She's my official pre-season pick to win. Taylor: Wow, this is the TX season, I love it! Over the top energetic and southern charm girl sold me already. She seemed really intelligent, and like she can play the game! I think she will make it extremely far, top 2 or 3 for sure. I can’t wait to watch Morgan, and Alex hopefully kill this game! Ashley: I'm putting this out there now, Morgan is my official pre-season winner pick. I really like her and think she can do great! She reminds me of Allison from BBCAN2 in a way. She's super bubbly and I think has the only pre-game strategy you can truly have without knowing who you're competing against: Get to know everyone. She also seems to understand that the odds of finding your soul mate in the house are pretty rare and probably won't give up her game for a guy. John: To be honest, Neeley reminds me of a knockoff version of Momma Day, but I still love her. She wants to create a all women alliance......yeahhhh we will see how well that goes. She says she wants to use her sexuality to advance herself if possible, but I just don't foresee that happening with anybody in this group. I predict she'll be the pot stirrer of the season and could bring us some entertaining moments. Overall, I'm looking forward to seeing how she plays the game. Taylor: Ft. Worth, Texas Woman!!! Yesssss. So close to my home-turf so I can’t not root for her. She seems to have the sass of Da! I can’t wait to watch her, I think she would be entertaining! But, the women alliance comment turned me off. I don’t think Nelley will make it far! Ashley: Neeley seems like so much fun! I love that she owns being a diva. That is exactly how everyone should walk into Big Brother, know who you are and understand your strengths or weaknesses and use them to your advantage. And let's be real here, I can always appreciate anyone who shares my love for makeup. John: Right off the bat, I get Steve BB17 vibes. But after watching his interview, I like him more than I liked Steve pre-season. Scott is very articulate and seems open to being adaptive with his game. Has a plan in place that I think could get him far. It's always fun seeing a superfan play the game, I have high hopes he'll go far. Taylor: Scott’s interview surprised me. I was NOT expecting him to be as cut throat, I pegged him as a Steve from BB16 like character. I think that Scott will be a decent player, and if he can get in or create a really strong alliance, I think he can ride it until close to the end. Ashley: There's always the one nerdy super fan and this time around we get Scott. I'm not sure that winning as many competitions as possible is the best strategy. Competitions are important but Big Brother is a social game, you need to go into that house and make friends and alliances. John: I was feeling good about Shane until he said he wanted to combine Vanessa and Austin's game? What!?! Then said he wants to get in a showmance, that's when I jumped ship. I don't think he knows what he's doing here, and I definitely can't see him making it to jury far. Taylor: Does anyone else think Shane kind of looks like Vic when he smiles? Or am I just crazy? I think Shane talks hard game, but won’t be a big player. I imagine a showman in his BBOTT future, and probably an early elimination. Ashley: Shane had me, I was team Shane until he said he would try to play like Vanessa but be in a showmance like Austin. This makes me think that's the only season he's seen and it was probably in sequester. Maybe he'll be able to get in a showmance that serves him well like so many have recently but please I beg you, do not act like Uncle Austin in anyway. Pick another player, any player. John: Plans to play dumb, but doesn't plan to hide the fact she's a lawyer? Don't see how that will work, but good luck to her. Is confident with her ability to manipulate people, some might say she's too overconfident for Big Brother. Her laugh is weird as hell, but I also find it kinda cute. Overall, she's interesting but I don't foresee her making it far. Taylor: Whoa, her laugh was too much for me. I wish I liked her, but I don’t. I don’t think she will play a good game at all. I think she is going use that “Over the Top Loud Mouth” and it will turn people off really quickly. Definitely one of the first to go. Ashley: I always worry about people who immediately walk into the house just thinking they can manipulate everyone. Sometimes I think coming in with that much confidence makes you think you're invincible and nothing can go wrong. I really worry about what's going to happen when she's on slop. Does she know what it means to be a Have Not? John: Meet our southern belle this season. Whitney says she's a "superfan" but I suspect she's a TV only viewer. Plans to use her southern charm to persuade people, but I just can't foresee that happening. I think she's sweet but not cut out for Big Brother. I suspect she'll get the boot (pun intended) within the first few weeks. Taylor: Whitney seems like a really sweet girl… but I don’t think she is ready for Big Brother. I kind of think she will play like a less competitive version of Bridgette from BB17, align with one person, then lay low until her eviction. Ashley: I'm convinced Whitney walked right off the set of Hart of Dixie and into the BBOTT house. She's super pretty but her entire video seemed super forced to me. Everyone else had these "over the top" personalities and she seems so mellow. It could help her stay under the radar but again with this format, it's hard to be able to say what's going to happen. Either way, she seems sweet enough so you never know! Let us know your thoughts on this seasons houseguests in the comments section! Don't forget to get your CBS All Access Subscription by CLICKING HERE! It's only $5.99/month. Follow us on Facebook & Twitter for all things Big Brother Over The Top!